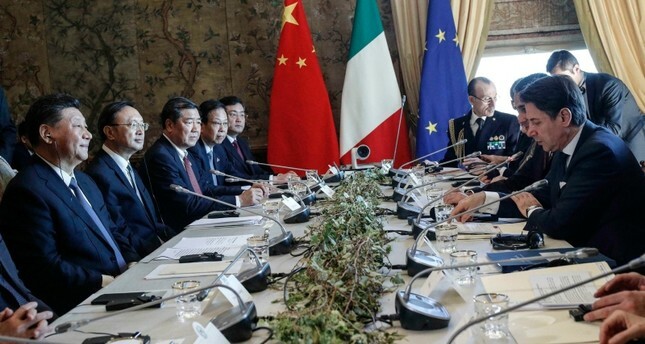 German Foreign Minister Heiko Maas has criticized Italy's decision over the weekend to join China's Belt and Road Initiative, while the EU's budget commissioner suggested the bloc could veto the foreign takeover of critical infrastructure in Europe. In a world dominated by major global powers like China, Russia and the United States, "we can only survive if we are united" as the European Union, Maas said in an interview published Sunday in the Welt am Sonntag newspaper. Maas warned that "China is not a liberal democracy." Countries that believe they can do "clever business with the Chinese will wonder when they suddenly wake up in dependency." Lucrative offers in the short term will soon leave a bitter aftertaste, he added. Italy officially joined China's Belt and Road Initiative on Saturday, becoming the first G7 nation to do so. The Chinese initiative, also known as the New Silk Road, aims to create new rail, road, port and energy links between China, Europe and Africa. Dozens of countries, including EU members Greece, Poland and Hungary, have already joined despite US and EU objections. European Commissioner Guenter Oettinger, a German national, in a separate interview suggested the EU should have the right to block China from taking control of critical European infrastructure. "I view with concern that, in Italy and other European countries, strategically important infrastructure projects - power grids, high-speed train lines or ports - are no longer in European hands but in Chinese hands," he told media group Funke Mediengruppe. Oettinger, the EU's budget commissioner, added that he believed member states were not taking their national and European interests into account. "That is why we should consider a European veto right or a European right of approval, carried out by the commission," he said.